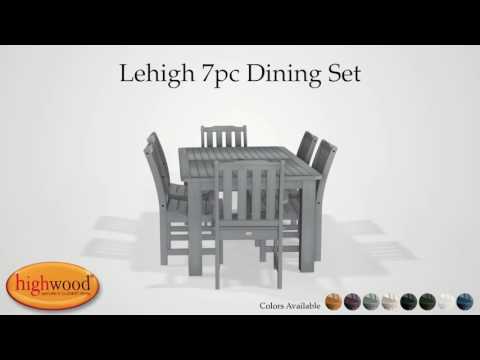 This Lehigh Dining Set features our classic 36in x 72in rectangular dining table with an umbrella hole, 4x side chairs and 2x arm chairs for a set that will serve as an impressive focal point for your outdoor dining area. The elegant and traditional lines of the Lehigh Collection make a beautiful surround in the chairs to our sturdy and well built table. In addition to dining in style, our material is friendly to dirt and grime so clean up is a breeze. Dining separates can also be purchased to expand your set further. The chairs have been load-tested, per ASTM 1561-03 (2008) standard for Outdoor plastic furniture and have a 500 pound weight capacity. Assembly is required (see assembly guide). Please note that this is a larger item that ships LTL. This material is the best thing to happen to me! It's strong, gorgeous and we don't have to bother with sanding and staining anymore. Time to find a new chore for my husband! Bought this in black last year and I'm happy to report that it has stood up to every single thing that our family and Mother Nature has thrown at it.